It is so good to see all of you on this beautiful spring morning. It has been good to praise and pray to Almighty God. And now we are ready to preach God’s all powerful word. Today I am presenting a lesson that many of you will understand plainly, because we have been studying the book of Daniel. Our subject today is THE EVERLASTING KINGDOM. All of you will remember 606 years before Christ, King Nebuchadnezzar and his Army came up against Jerusalem. He took into captivity a lot of the Jewish people, among which was Daniel, Hananiah, Mishael, and Azariah. They were taken to Babylon. Isaiah# and Jeremiah# both prophesied about 100 years earlier that God’s people would be in captivity in Babylon for 70 years. After this they would return back home to Jerusalem. Nebuchadnezzar commandeered Daniel and his three friends to take special training for three years. 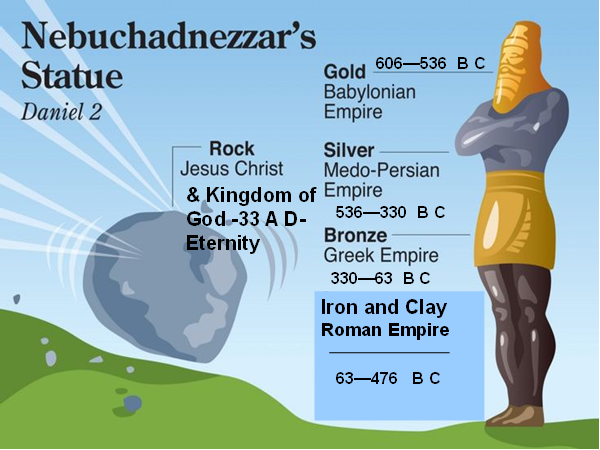 They were given new names in honor of the gods of Nebuchadnezzar. Daniel’s new name was Belteshazzar. The three boys had their names changed to Shadrach, Meshach, and Abednego. They were all trained in the language, wisdom, and science of the Babylonians. King Nebuchadnezzar was wise in that he wanted to use the wisdom and understanding of these foreigners to serve in his own government. King Nebuchadnezzar had a great dream one night. He had a vision in his head while he was sleeping on his bed. When he woke up he could not recall that dream. So he called all of his magicians, soothsayers, wise men and the Chaldeans. I want you to tell me my dream because the thing has left me. It has gone from me. I cannot remember it. Tell me the dream and the interpretation. So they all came before the King and declared that they could not tell the king his dream nor the interpretation. They said, “Tell us the dream and then we will give you the interpretation.” Nebuchadnezzar replied that he knew they were just stalling for time. They hoped that his dream would come back to him and then they would give an interpretation of it. Nebuchadnezzar rebuked them sharply and said if you cannot tell me the dream and the interpretation, all of you will be destroyed. They replied to him that no King had ever demanded such from his wise advisers. They said only the gods could do such a thing and they do not dwell in the flesh. Therefore Nebuchadnezzar sent out the edict to destroy all the wise men in Babylon. And of course this would include Daniel, Shadrach Meshach and Abednego. Daniel said to the man in charge, “Why are you in such a hurry to carry out this sentence?” Take me to the King and I will talk to him about giving him the dream and the interpretation of it. Daniel went before the King and he was given some time to consider the matter. Daniel and the three boys went back to their room and they prayed to God fervently that he would show Daniel the dream and the interpretation. Today we sung a beautiful hymn about the power of prayer. God answers the prayers of his people. God answered their prayer and to Daniel was given the dream and the interpretation. And so Daniel went before the King and declared the dream and the interpretation to Nebuchadnezzar. King Nebuchadnezzar you had this dream that came into your head while you were on your bed. And the dream was this: you saw a great image of which the head was gold. The arms and breast of this image was made out of silver. The belly and the thighs were made of brass. And the legs were made out of iron. And the feet were made out of iron and clay. And then you saw a little stone that was cut out of a mountain without hands. This little stone smote this great image upon the feet, and it was destroyed and passed away like the chaff of the summer threshing floor. The wind carried it away and no place was found for them. 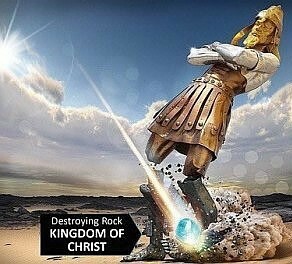 And the stone that smote this great image became a great mountain, and filled the whole earth (Daniel 2:31-35). The next order of business for Daniel was to give King Nebuchadnezzar the interpretation of this dream. You, O King Nebuchadnezzar are the head of gold. After which another kingdom shall arise that is inferior to yours. It is represented by the silver. And then there will be a third kingdom that will be like brass. And finally there will be a fourth kingdom. And this kingdom will be partly strong and partly weak, inasmuch as you saw clay mixed with iron. Just as iron and clay do not mix, so the citizens of this fourth kingdom will not mix together. They will mingle with the sons of men, but they will not cleave together. Therefore, Daniel declared to King Nebuchadnezzar that the Babylonian, Medo-Persian, Grecian and Roman kingdoms would all crumble and cease to be. History bears out that Daniel’s interpretation is exactly what happened from 606 BC to 476 A.D. The following image will picture the fall of all of these kingdoms. Having described the image and the interpretation, it is now in order to speak of Daniel’s prophecy concerning the everlasting kingdom that would stand forever. We have the Babylonian kingdom—the head of gold. This kingdom lasted from 606 BC to 536 BC. The next kingdom in order is that of the Medes and the Persians. This is often called the Medo-Persian Empire. It is represented by the silver. And it stood from 536 BC to 330 BC under the leadership of Darius the Mead and Cyrus the Persian. The third kingdom represented by the bronze is that of the Greeks under the leadership of Alexander the Great. He was able to conquer the world, but was not able to conquer himself when he died from a drunken stupor after drinking the Herculean Cup. His kingdom lasted from 330 BC until 63 BC. Our last kingdom is the kingdom of the Caesars that continued from 63 BC until 476 A.D. It started with the assassination of Julius Caesar and ended when the barbarian tribes came down from the north and crossed the Rubicon River. If this kingdom that the God of heaven would set up in the days of the Roman Kings would stand forever, then it is THE EVERLASTING KINGDOM! “Inasmuch as you saw that the stone was cut out of the mountain without hands, and that it broke in pieces the iron, the bronze, the clay, the silver, and the gold—the great God has made known to the king what will come to pass after this. The dream is certain, and its interpretation is sure” (Daniel 2:45 NKJV). What does this mean? What is the interpretation of the little stone? The little stone is of divine origin. It came into being from Almighty God. This little stone represents the everlasting kingdom that will start out very small, but eventually become a great mountain and fill the whole earth. Jesus had this in mind when he taught the parable of the mustard seed: “The kingdom of heaven is like a mustard seed, which a man took and sowed in his field, which indeed is the least of all the seed; but when it is grown is greater than the herbs and becomes a great a tree, so that the birds of the air, nest and its branches” (Matthew 13:31-32 NKJV). This means that the kingdom of heaven would start out small, and then grow and spread all over the world until it became like a great mountain. Now someone may ask when was this everlasting kingdom established or inaugurated. The everlasting kingdom that would stand forever did not come into being until after the resurrection of Jesus Christ. The kingdom of God or the kingdom of heaven—the everlasting kingdom that will stand forever did not come into existence until after Jesus rose from the dead. Someone will speak up and say, “Prove that to me!” That is no problem and here is the proof. Very early in the life of Christ we read that his cousin John the Baptist arrived on the scene. The Bible declares, “In those days John the Baptist came preaching in the wilderness of Judeo, and saying, repent, for the kingdom of heaven is at hand” (Matthew 3:1-2 NKJV). Was the kingdom established when John came on the scene? No! He said the kingdom of heaven was “at hand.” If something is at hand that means its close, it is nearby and it’s not far away. Shortly thereafter John the Baptist was put in prison and the Bible says, “Jesus came to Galilee, preaching the gospel of the kingdom of God” (Mark 1:14 NKJV). We notice that John spoke of the kingdom of heaven and Jesus spoke of the kingdom of God. They are not two different kingdoms, but one and the same. And we also notice that this was done “In the fifteenth year of Tiberius Caesar” (Luke 3:1). Therefore the obvious conclusion is that the kingdom of God was near or at hand in the days of the Roman Kings. Also in the parable of the sower Jesus spoke of “the kingdom of heaven” and “the kingdom of God” in that same lesson (Matthew 13:11; Mark 4:11). So they are one and the same kingdom. In another conversation the Lord stated that “the least in the kingdom of heaven” is the same as “the least in the kingdom of God” (Matthew 11:11; Luke 7:28). Both of these expressions referred to the everlasting kingdom that will stand forever. “And I also say to you that you are Peter, and on this rock I will build my church, and the Gates of Hades shall not prevail against it. And I will give you the keys of the kingdom of heaven, and whatever you bind on earth will be bound in heaven, and whatever you loose on earth will be loosed in heaven” (Matthew 16:18-19 NKJV). What do we learn from all of this? That Jesus promised to build his church and give the keys of the kingdom of heaven to Peter and all of the apostles Matthew 18:18). We have also learned that the church and the kingdom of heaven are expressions of the same everlasting kingdom promised by Daniel 2:44-45. And on the day of Pentecost, the apostle Peter used those keys (terms of admission) for people to be added to the church by the Lord (Acts 2:36-47). But when did Christ established his kingdom? Now when He had spoken these things, while they watched, He was taken up, and a cloud received Him out of their sight. And while they looked steadfastly toward heaven as He went up, behold, two men stood by them in white apparel, who also said, “Men of Galilee, why do you stand gazing up into heaven? This same Jesus, who was taken up from you into heaven, will so come in like manner as you saw Him go into heaven” (Acts 1:9-11 NKJV). After Jesus died on the cross and was raised from the grave on the third day, the Bible declares that he spent about 40 days talking to his disciples about things pertaining to the kingdom of God (Acts 1:3). During this time, his disciples asked him when he would restore the kingdom of God to Israel: “Lord, will you at this time restore the kingdom to Israel” (Acts 1:6)? Earlier in the life of Christ, Jesus promised his apostles that there would be some of them who would not taste of death until they had seen the kingdom of God come with power (Mark 9:1). The kingdom of God then would need to be established during the lifetime of some of the apostles. Therefore, just a few days before the day of Pentecost the kingdom of God had not yet been established. This narrows the timeline down quite a bit. Jesus replied to the apostles, “It is not for you to know the times or the seasons which the Father has put in his own power, but you shall receive power after that the Holy Spirit is come upon you…”(Acts 1:7-8). Therefore, the kingdom of God will come when they receive power. They will receive power when the Holy Spirit comes upon them. And the Holy Spirit did not come upon them until the day of Pentecost (Acts 2:1-4). Therefore the kingdom of God was established on the first Pentecost Sunday after the resurrection and ascension of Jesus Christ. In the beginning, the church or the kingdom of God was established in Judea and the surrounding area. It was not until the church was established at Antioch in Syria that the kingdom of God would be taken throughout the then known world. Paul and his companions took three evangelistic journeys establishing churches in almost every city. The gospel and the kingdom of God were taken to many faraway places even as far as Rome. THE KINGDOM OF GOD WAS IN EXISTENCE IN 63 A.D.
“He has delivered us from the power of darkness and conveyed us into the kingdom of the Son of His love, in whom we have redemption through His blood, the forgiveness of sins” (Colossians 1:13-14 NKJV). Where had these people been—the kingdom of darkness? Who rules in that kingdom? Satan! He was a liar from the very beginning. But Paul says they had been translated out of that kingdom into the kingdom of God’s dear Son. Obviously then, the kingdom spoken of by Daniel, John the Baptist and Jesus Christ, was in existence by 63 A. D.
How did people enter that kingdom? While Jesus was living he had an interview with Nicodemus. Jesus stated emphatically to Nicodemus that unless one is born of water and the Spirit he cannot enter the kingdom of God (John 3:3-5). Therefore we are born into the everlasting kingdom. It is called the new birth. We enter three kingdoms by a birth. We enter the kingdom of nature by a birth of and from the womb. This is natural life. We enter the spiritual kingdom by a new birth of water and the Spirit. This brings about spiritual life. And we enter the kingdom in heaven by a birth of and from the grave. And this is eternal life. The kingdom of God was also in existence when Paul wrote his great letter to the church at Rome. Paul wanted to go to Rome and visit God’s people at that location. But he wrote a letter to the church at Rome before he ever entered that city. In this letter he said, “For the kingdom of God is Not eating and drinking, but righteousness and peace and joy and the Holy Spirit” (Romans 14:17). The kingdom of God is just the opposite of the kingdom of Belshazzar who had a drunken party with all of his government officials and concubines on the night that he was slain (Daniel. 5:30). The kingdom of God is a spiritual kingdom and not a worldly kingdom. My friends, the kingdom of God or the kingdom of heaven, is not eating and drinking and having a big party. What is it? It is righteousness, joy, peace and the Holy Spirit! And there is one more scriptural passage that establishes the fact that the kingdom of God was established during the first century. Therefore we should not look for the kingdom of God to be established sometime in the future. The writer of the book of Hebrews addressed his letter, “To the general assembly and church of the firstborn who are registered in heaven, to God the judge of all, to the spirits of just men made perfect” (Hebrews 12:23 NKJV). The term firstborn in the original language is in the plural, and therefore refers to all who had been inducted into the church or kingdom. Those who had been baptized into Christ were the firstborn ones to whom he wrote this letter. And therefore their names had been registered in heaven. Therefore, the book of Hebrews that was written in the first century states emphatically that there were citizens inducted into the church or born into the kingdom of God. “Therefore, since we are receiving a kingdom which cannot be shaken, let us have grace, by which we may serve God acceptably with reverence and godly fear” (Hebrews 12:28 NKJV). But someone will say, “If one is already in the kingdom, how can one be receiving the kingdom?” The answer is simple. When one enters the kingdom as a citizen, their responsibility and obedience to the King does not stop when they enter that kingdom. We must continue to be faithful and not fall away. This is exactly what Paul stated to the congregations on his first in evangelistic journey. He exhorted them “… To continue in the faith, and that we must through much tribulation enter into the kingdom of God” (Acts 14:22). Therefore, while we are in the kingdom, we must continue to hear the word of God and be faithful to our King. And that brings us to our final argument that the kingdom of God is now in existence. In order to have an “abundant entrance” into the everlasting kingdom when we pass from this earth, we must grow in the grace and knowledge of our Lord Jesus Christ. In his second letter Peter addressed the idea of being faithful in the kingdom even to the point of death. They could be faithful by adding to their faith, virtue; and to virtue knowledge; and to knowledge temperance; and to temperance patience; and to patience godliness; and to godliness brotherly kindness; and to brotherly kindness love (2 Peter 1:5-7). “Therefore, brethren, be even more diligent to make your call and election sure, for if you do these things you will never stumble; for so an entrance will be supplied to you abundantly into the everlasting kingdom of our Lord and Savior Jesus Christ” (2 Peter 1:10-3 NKJV). These disciples were already in the kingdom, but they had to make their calling and election sure in order to have that abundant entrance into the everlasting kingdom in heaven. The everlasting kingdom of God does not cease to be, when the curtain has been drawn on the drama of human redemption on this earth. The everlasting kingdom stands forever. It is eternal. When the angel Gabriel appeared to the virgin Mary, the angel announced to her that she would give birth to Jesus, and that he would reign forever, and of his kingdom there would be no end (Luke 1:31-33). So the message of the angel to Mary agrees with the statement of Daniel to King Nebuchadnezzar, that God’s kingdom would stand forever (Daniel 2:44). According to John, this takes place at the resurrection of the just and unjust. When the great apostle Paul wrote the church at Corinth about the resurrection, he also affirmed that the everlasting kingdom of God will be delivered up to the Father in heaven. Those that belong to Christ in his everlasting kingdom will be resurrected at the second coming of Christ (1 Corinthians 15:23). But according to Paul then will be the end! And what will take place then? “Then comes the end, when He delivers the kingdom to God the Father, when He puts an end to all rule and all authority and power. For He must reign till He has put all enemies under His feet. The last enemy that will be destroyed is death” (1 Corinthians 15:24-26 NKJV). #Babylon is mentioned in 15 verses in Isaiah and 150 verses in Jeremiah. They predict Judah’s Captivity and the Fall of Babylon the Great!